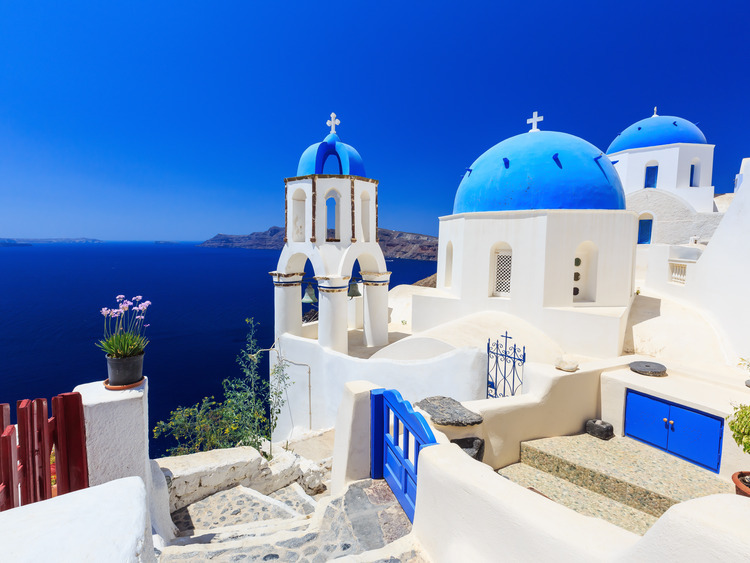 A unique opportunity to visit Santorini's most picturesque corners, admire its most breath-taking landscapes, soak up the local life and sample the most genuine and authentic flavours of this part of the Mediterranean. We will set off by coach from the small harbour at Athinios for Profitis Ilias Mountain (Prophet Elijah Mountain), the highest peak on the island, with its astonishing colours and contrasts. We will immerse ourselves in the culture of the island to discover its flavours, atmospheres and traditions, before continuing on to the village of Megalochori to see the charming houses built into the rock and narrow alleyways. The island is well-known for its wines, so we cannot let slip the opportunity to sample Santorini's famous wine, which has the same warm and attractive colours as the island itself, in a local tavern. We will then continue to our last stop: the island's capital, Fira, where we will get lost in its maze of alleyways, where the blue domes of the white houses blend with the sky, and where the friendliness and hospitality of its inhabitants extends into its shops. We will take advantage of some free time to buy souvenirs or delicious local gourmet specialities.